Nifty and Bank Nifty January futures are currently in positional sell mode on the hourly charts after breaking the support zone on 2nd Jan 2014. Currently the resistance zone comes near 6260 and 11282 respectively. Reverse your position to positional buy mode if the support breaks on the hourly charts. Markets are trading in a completely sluggish and sideways fashion due to compressed VIX index. On the Options side neither the Call Writers nor the Put writers are confident on the market move as there is a considerably less amount of open interest builtup on the particular series. 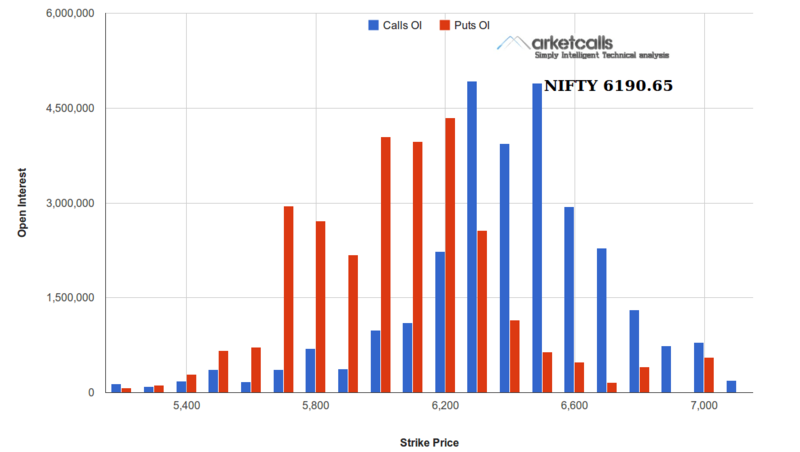 As of now 6300CE and 6500CE holds the highest and almost equal amount of open interest and on the put side 6200 holds the higher open interest but considerably lower than 6300CE and 6500CE. Which shows that option writers are still slightly negatively biased however still considering 6150-6200 as the support zone for the current option series.